Gene knockin (KI) is the process of targeted insertion of an exogenous gene at a specific locus in the genome. It is used to modify the function of an endogenous gene in order to study the detailed mutations of small nucleotide in human disease. In some genetic diseases, only a particular portion of the gene might be responsible for its occurrence. In such cases, gene knockout technique is not appropriate as it leads to complete deletion of the gene. 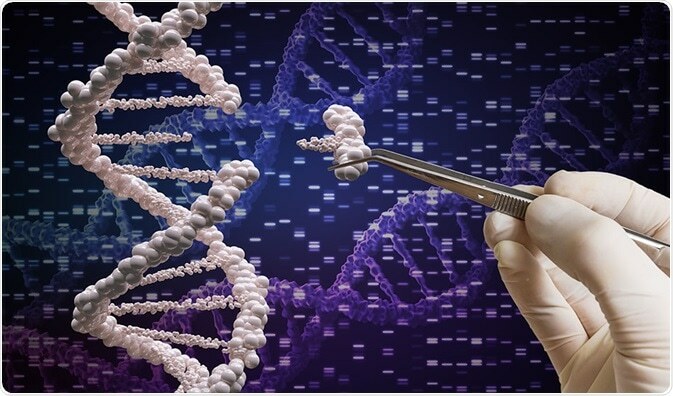 When compared with random integration, which can insert at multiple sites and cause gene disruption, gene knockin inserts a gene only in the known locus, making it safer and more reliable. The general procedure of gene knockin is the same as that of conditional knockout through homologous recombination. However, the endogenous sequence is replaced with a DNA mutated gene without any disturbance of the gene in the knockin method. Step 1: A DNA construct containing a specific gene such as mutated or reporter oncogene is taken. Step 2: These genes with flanking sequence (also called loxP) undergo inverse recombination when they are exposed to the sites carrying Cre-recombinase enzyme. This results in the omission of intervening DNA. Step 3: Then the modified gene is introduced to the endogenous locus. Step 4: Embryonic stem cells carrying the modified gene is inoculated into a cavity of an early mouse embryo. This is then implanted into a surrogate female mouse, where the mouse embryo matures into a chimeric mouse with germ line carrying the transgenic gene. Step 5: The offspring of this chimeric mouse carry the gene knockin. This technique allows tissue-specific expression of the mutant gene from their endogenous promoter and avoids problems of random integration. Another technique involves targeted insertion of a specific coding sequence into a ROSA26 locus, a site commonly used for targeted transgene expression; this process is stated to be non-interruptive. Skin disease modeling: Knockin technique is used in generating mouse models for the comprehensive study of human skin disease. Example: The mice carrying mutant keratin 10(K10), which shows epidermolytic hyperkeratosis that closely resembles the phenotype found in human patients, carrying the same mutation. The new molecular-based characteristics, like suprabasal keratins, were recognized in the knockin mouse, which enables a pathway for scrutinizing this disease in vivo and innovation of therapeutic applications. Modeling of Huntington’s disease: Huntington’s disease (HD) is a hereditary disorder resulting in the degeneration of brain cells. The gene which encodes the huntingtin protein, having an irregularly expanded and unstable CAG repeat within its coding region, is the major mutation responsible for the occurrence of this disease. Knockin mice possess an advantageous ability of controlling HD by restricting the mutation responsible for this disease, using a suitable protein under the endogenous Hdh promoter. The deviations in the interaction of therapeutic agents with a specific molecular target restrict the use of wild-type mice as a preclinical tool to obtain efficiency and to perform safety testing. In order to evade such problems, mice models that have comparable characteristics found in the humans for a certain drug target can be tested. Example: The mPGES-1 knockin mice, which provides an excellent example for drug effectiveness and safety application. MF63 and a selective PGES-1 inhibitor were introduced in mice models for examining the occurrence of inflammation in them. MF63 showed strong hindrance to human mPGES-1 in human cells in vivo, whereas it revealed negligible activity against mouse mPGES-1. In addition, the substitution of Taconic gene (a part of mouse ptges gene) with human ptges minigene was carried out. The treatment of this knockin mouse with MF63 resulted in the prevention of PGE2 synthesis and exhibited a reduced inflammatory response in the affected mice, as per the expectation. It allows replacement of the gene-of-interest with mutated allele to mimic a human disease. Site of integration is well known. Conditional and constitutive knockins are also possible. This technique is more compatible with an inducible system that allows the study of mutation effects that closely resemble the cause of human disease. It allows study of the effects of genes with altered functions. The study of functional protein can be carried out in-depth. Development of complexity occurs due to the combination of transgenes that lead to many side effects. The forced overexpression of the genes produces artifacts that lead to unspecific protein–protein interaction. This method takes more time to find the ES cells that have undergone homology recombination and to group the vector. The knockin mouse generated does not entirely resemble the pathology of human disease. Conditional knockin of exogenous gene such as reporter gene can be achieved only in the presence of well-characterized loci such as ROSA26. This increases the difficulty in combination of transgene and the reported gene in the same locus.